Ok, so this picture is perhaps a little more literal than my usual choices for artwork, but I am on a trip down memory lane and sentiment is kicking in. 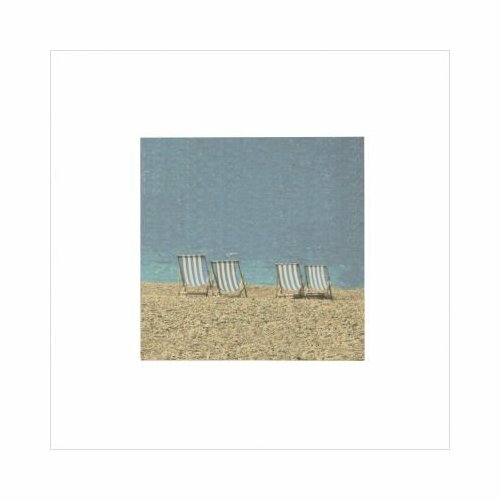 The rug I chose for the beach style bedroom, reminded me of the very deckchairs featured in this piece, so I just couldn’t resist including this piece of beach artwork here. This art piece also happens to to have a color palette that works very well with colors chosen for our room – you see it it not all about being sentimental! When choosing artwork or other decorative effects for your room, you need to decide if you want something that blends well with your color scheme or if you want a piece which will make a bold statement of it’s own and will be a significant feature in the room. I have gone for the first option in this case. Another alternative for this room would be to add a group of photos or some prints, perhaps in white distressed frames. The picture shown above is on canvas and doesn’t require a frame. It is 10″ x 10″ so if you have a large room you might want to consider either a couple of pieces this size or a larger piece. The Beach Chair Artwork above is from Amazon and is currently available at 35% discount (at time of writing).